Front of the Cambodian National Museum. 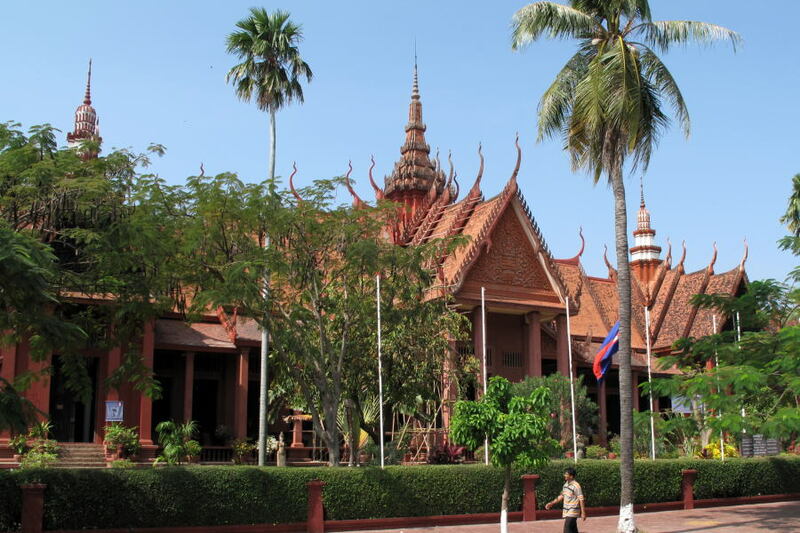 The Cambodian National Museum is housed in an elegant Khmer styled red sandstone building just north of the Royal Palace walls. As you approach (and most likely photograph) the building from the park in front, the entrance is through the street corner on your right. 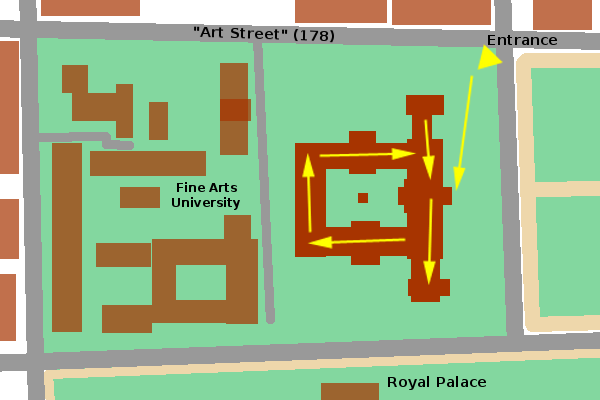 Arrows indicate the suggested path through the museum. In plan, the layout of the museum is quite simple. The wide front wing facing the park is backed by a slightly smaller "U" shaped gallery forming a very pleasant courtyard. The logical route through the museum is to turn left on entering the main doors, and then proceeding clockwise through the galleries. About half the galleries are devoted to stone sculptures from the ruins around Angkor Wat and that era. Among the "prized" pieces are the statue of the leper king from Angkor Thom, a reclining Vishnu statue from the West Mebon and a pediment from Banteay Srei. I found the pediment quite interesting. It's placed right at eye level, so you can get a much better view of it that you can at the temple itself. The pediment depicts a scene from the Mahabharata, a great hindu epic about a family feud. In the scene, a man holding a long spear against an attacker is "supported" by a four-armed god. The embrace seems quite intimate, although perhaps when you have four arms it's hard for an embrace not to be intimate, and the man looks not at his foe, but back over his shoulder into the eyes of the god. The remainder of the museum displays items from more modern times, such as royal accoutrements, a small barge, howdahs and urns. The museum is open every day from 8:00 to 17:00. Admission is US$3, paid at the booth just inside the gate.